I though it was time for me to tell you about a great app my hooman has on his iPhone. It's called - My Dog Uk app. Before I start the great news is it's free and available on google, android and iPhone. It's also in association with petlog and the kennel club. This is the home screen with my photo as the background. I want to talk first about the best feature the lost pet alert section. Have you ever thought how many phone calls or visits it would take if you lost your pet. 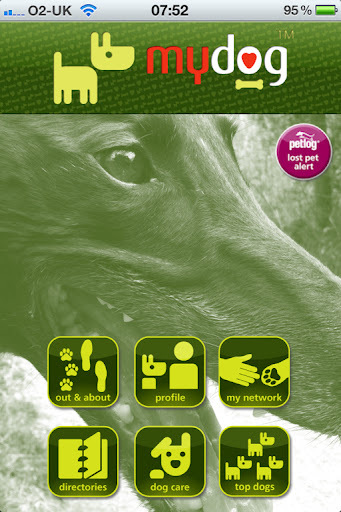 With this app if your dog is registered to the premium petlog service you can notify your dog is lost from the app and they will immediately notify registered agencies such as vets and dog wardens within a 30 mile radius. No need for all those calls. 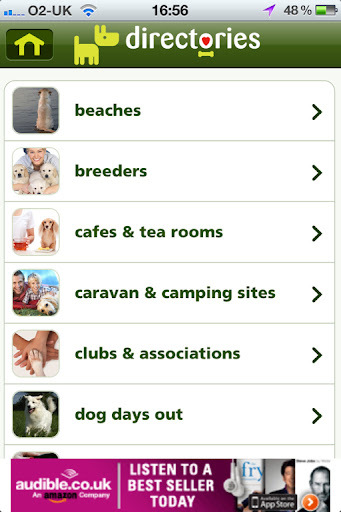 Another great section is the out and about section with 25,000 dog friendly places in 20 categories. It also has a place to put your dogs profile and allows multiple dog profiles. Add photos to a wall and summit them to my dog photo wall, pet care, vet care, training advice a lot of features that you may normally need other apps for. The vets information could be useful if you are out and get a problem as it uses the gps on your phone and tells you the nearest vet. My hooman has lots of dog apps on his phone but this is his favourite. Try it as its fab and better still it's free! Hi Rolo, thanks for mentioning our app. We think it is pretty helpful too! We also have a Facebook page and Twitter if you would like to keep up to date with any updates, news and special offers. Don't forget, June is National Microchipping Month so there will be extra offers from Petlog including a discount for their premium service.